Good numbers to know. Perhaps with a set of decent big block springs, you won't need modifications front or rear. I wasn't sure what the weights of the 429 and 460 engines were, but if a 429CJ is 1100 pounds, that should be smack dab in the middle of the proverbial ballpark. When I see my friend Kyle, I'll ask him what he did for the throttle on his F100. pretty much minus the 12qts of oil in her gullet. Thanks I will keep that in mind. I will have to see what the travel looks like once I get everything all put on it like I want, them hoods ain't any kind of light. I brought home the Longacre scales from my old work one weekend, and weighed my 460, minus power steering pump, and it was 625 lbs (granted, it had an aluminum intake & water pump and headers instead of heavy cast iron exhaust manifolds). My C6 was 180 lbs, for a grand total of 795 lbs (round up to 800, for fun). Where the hell does yours get that extra 300 lbs from? Oil and coolant. I know the manifolds are heavy, but jeez. 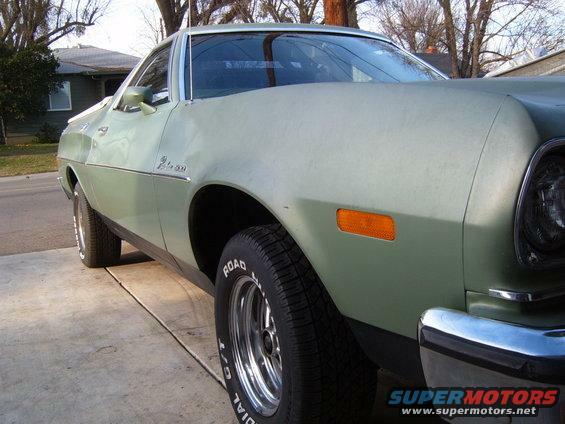 My Ranchero, minus interior, engine and transmission, weighed 2660 lbs. I have the slip, somewhere. Didn't break it up into individual parts Sean. It was fully dressed = All brackets, steering pump, alternator, a/c compressor, carb, distributor, belts, cast iron intake and exhaust manifolds, shaker air filter assembly, 7 quarts oil. It was .030" over bore with Ross flat top pistons, some huge "H" beam rods. The C6 was a true Cobra Jet version that had heavy internal drums, wider band, and a cast iron tail casing. If I remember correct it had a 10" stall converter and no fluid when weighed. Those CJ exhaust manifolds are huge compared to stock 429/ 460 exhaust manifolds. No coolant. I dunno' where the biggest difference really was. Think 460 is around 720#.I have a pair of new lincoln springs you can have XO,if current set up doesnt work out. Interesting thread,maybe mods can move to stable? Well now if your talking to me about springs, That may be a thing, I'll have to drop by a company here in town called Rocky Mountain Spring and see what they don't say on price of a set ment for this kind of weight. Everyone knows the saying.......do it once, do it right -or- the 6P's Prior Planning Prevents Piss Poor Performance. Put them in my 73 with cleveland motor.Sat on upper bump stops,never settled.Ended up putting stock springs back in.These are free,plus ride from Nev.Do it more than once,you become proficient! mmmmm.....I kind of wish that I had kept my 74' I love round head lights better than the double stack squares, though the side by side squares aren't too bad either. That's what I have planned is a Cougar front clip swap. Or, if you still want round headlights, a T-bird clip swap. I've thought the same, though I've been tossing around the idea of a mercury Marquis or lincoln swap as well. I will definitely know more of what I want to do cosmetically later. For right now the focus is to get everything plumed up so it'll be more than the obligatory......."hey look I put it in, now what"
Waiting for someone to try stuffing a 3208 turbo V8 Cat off into a car. You would have to chop a section out of the middle of a Marquis or Town Car nose, too wide. MK IV might be close. Ever looked at a two round headlight Torino Elite nose ? Hey! Don't go tempting me now because I do possess both the 3208T and the 8.2L detroit turbo diesel. Yes I actually have though getting one for a half way decent price is a little tricky. Was the orange bucket a factory option for that year? I don't think it will fit on my '64. So I'm talking to Kyle, and he says that your drop in is really solid; he made a suggestion of sourcing front coil springs from an F250 light duty (7200# GVWR) and cut them down so it has the correct ride height and the weight carrying capacity. Sounds like a pretty good idea to me, which decade are we talking here? Because Ford likes to seemingly change things every 5 seconds, though I have the feeling 68-79 f250 ranger -or- 1ton camper special 2wd. I've had a gorgeous 68' 250 and 69'factory camper special 1ton dually. The rigs I'm referring to are the '80-'96 3/4 ton LD ones in 2WD. Mine had the same size tank too! Which I had noted as pretty small for the rigs size/weight. Mine had a nice 4spd standard and factory working air conditioning + radio! I wonder if the e350 van springs would work, they are same as the trucks just in a different platform, 2wd that is. As far as the 19 gallon tank and the 390-6V/4-speed, Dad said it got 4 MPG. Bombing down the new interstates at 70 MPH? 4 MPG. Tooling around town? 4 MPG. Climbing a steep hill? 4 MPG. Rolling downhill, barely in control? 4 MPG.